March 2014, Vol. 31, No. 1, pp. 34-41. Introduction: A low-level laser therapy (LLLT) device emitting 635 nm of red light is an effective, noninvasive method of reducing the circumference of the waist, hips, thighs, and upper arms. 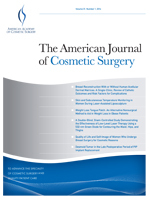 This randomized, double-blind, sham-controlled study assessed the effectiveness of an LLLT device emitting 532 nm of green light for body contouring using the same treatment protocol as the red 635-nm LLLT device. Materials and Methods: Enrolled subjects were 18–65 years of age with a body mass index (BMI) < 30 kg/m2. The LLLT device consists of 5 independent diodes, each emitting 17 mW of green laser light with a frequency of 532 nm (Erchonia ML Scanner, Erchonia Corporation, McKinney, Tex). Subjects were randomized to receive active (n = 35) or sham LLLT treatments (n = 32) over a 2–week period. Three treatments were administered each week, 2–3 days apart. Efficacy assessments included waist, hip, and thigh circumference measurements; body weight; and BMI following 3 LLLT treatments (week 1), 6 LLLT treatments (week 2), and 2 weeks following the final procedure. A treatment satisfaction survey was completed at week 2. 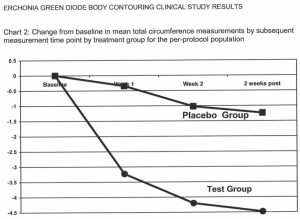 The primary efficacy outcome measure was the change in total combined baseline circumference measurements at week 2. The criterion for individual treatment success was ≥3.0-inch reduction in combined circumference measurements, and overall study success was ≥35% difference in the proportion of subjects in each treatment group achieving individual treatment success. Secondary efficacy outcomes included the change in total combined baseline circumference measurements at each subject evaluation as well as satisfaction survey results. Results: At week 2, the LLLT-treated subjects demonstrated a mean (SD) decrease in total combined circumference measurements of 3.9 (3.0) inches (P < .0001) compared with 1.1 (2.3) inches for sham-treated subjects. Among LLLT-treated subjects, 24 (68.6%) achieved a ≥3-inch mean decrease in total combined circumference measurements compared with 6 (18.8%) in the sham group (P < .0001). The effects of LLLT treatment were independent of baseline body weight, BMI, and total baseline circumference measurement. Compared to baseline measures, the LLLT-treated subjects demonstrated significant decreases in circumference measures for each individual treatment area at the week 1, week 2, and 2 weeks posttreatment evaluations. Among subjects responding to the satisfaction survey, an overall satisfaction response was obtained from 65% of LLLT subjects versus 19% of sham-treated subjects. Conclusions: The use of LLLT device equipped with 532-nm green diodes is a safe and effective means for noninvasive body contouring of the waist, hips, and thighs.